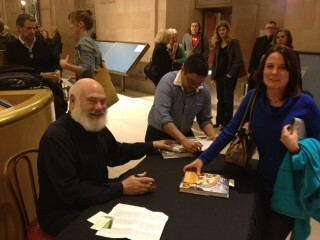 Dr. Andrew Weil’s latest book tour stopped in San Francisco last week. He’s on the road to promote his latest literary effort, a cookbook – True Food – based on recipes he cooks at home and are served in his emerging restaurant chain. Dr. Weil and a fan at his recent lecture and book signing event in San Francisco. As part of his Weil Lifestyle campaign the book purports to establish a new healthy lifestyle and healthier recipes while rebutting the myth that ‘health food’ has to be bland or worse. Dr. Weil was interviewed at Herbst Theater by fellow cookbook author Molly Katzen who spent an hour fawning of the integrative health guru while leaving it to the audience to ask controversial questions. Dr. Weil’s book offers recipes based on his own food pyramid which, while different from the hated FDA guide, leaves out very few foods that have led to the United States obesity epidemic. In fact , Dr. Weil probably is a pretty good representative of the US population since he clearly doesn’t skimp on any meals. A doctor approaching obesity levels may not be the best spokesman for a healthy lifestyle. Dr. Weil said he was also scouting sites for a new restaurant – one featuring good healthfood similar to the locations in Los Angeles, San Diego and Phoenix. The fact that the Bay Area has been a leader in the trend Dr. Weil promotes doesn’t seem to rate a mention even though places such as Cafe Gratitude, Planet Organic or Gather are way ahead of the good doctor. Dr. Weil was asked about supplements and admitted that, aside from a daily multi-vitamin, most folks can get all the nutrition they need from a healthy diet. This does seem to question the range of supplements marketed and sold by Dr. Weil on his own website. Dr. Weil also took a minute to chastise the assembled group for the failure of Proposition 37 the GMO labeling question of the November ballot. “How you could let that fail?” has asked. No one rose to answer, but I would note there were several folks in the room who had worked very hard to get the proposal on the ballot and promote it’s passage. No doubt a few of them were a bit insulted that someone from Arizona, who did nothing to oppose the $50 million ad campaign put on by the Monsanto and Dow, would criticize their efforts. Dr. Weil clearly does not oppose GMO food, preferring to wait for more evidence before branding it unhealthy. Of course, some folks would rather that it get proven healthy before allowing it in the food chain. I’m afraid Dr. Weil has lost his way by promoting a food pyramid that would do little to improve the health of most Americans, selling suplements that he admits are mostly unnecessary and declining to oppose foods that have been shown to be unhealthy. I’m sure it will do little to hurt his image or his income.